The Samsung Galaxy On 7 Pro is normal and looks premium. The rear camera is fit for shooting and recordings in Full HD (1980 x 1080). It takes too much time for charging. The problem is when i turn the brightness at its lowest the screen starts blinking. My Samsung on7 automatically switch off and switch on itself. This phone has it all a big screen, nice RAM, great camera, super built, amazing design, enough storage for apps and music. What it lacks is a good battery and a better processor. Gaming is not a great experience but for this price, this is a very reasonable phone. I would recommend it to you If you are not a gamer and need this for normal daily usage. This phone is very cost worthy. At this price you are getting quality with brand. its screen size and resolution is very good and battery backup is also nice. If we are talking about camera it is better than any other brand in this range. Bought this phone about an year ago and finally writing a review about what honestly i felt about this phone. So the phone is cost worthy with good battery life and good looks(someone thought my phone costs around 22000) but front camera quality is not that great, the camera doesn&apos;t pic but colours and rather show a faded image, thats my only concern. 16 Pricebaba users have written their experience with Samsung Galaxy On7 Pro. 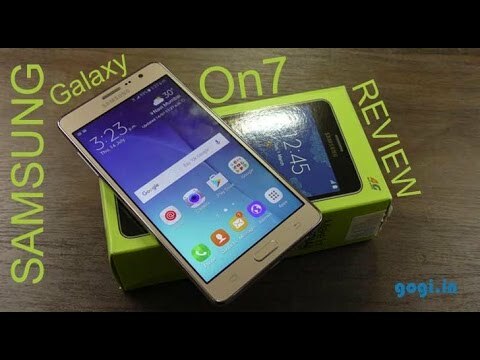 If you own Samsung Galaxy On7 Pro, please do leave your feedback too. Lowest price of Samsung Galaxy On7 Pro price in India starts at Rs. 7,888 Samsung Galaxy On7 Pro is available on Flipkart at Rs. 7,888. Prices updated on 23rd April 2019. Debuting with the On series in 2015, Samsung, this year has launched the successors of the series, Galaxy On5 Pro and the Galaxy On7 Pro. Both the phones have got a similar design and sizes with respect to their predecessor models. Samsung Galaxy On7 Pro majorly has just three differences from the Galaxy On7 2015 and thus justifying the price difference of just around Rs. 200. The changes are as follows: 1. Galaxy On7 Pro now has 2GB of RAM upgraded from 1.5GB of the Galaxy On7. 2. The successor now has 16GB of internal storage up from 8GB in it's predecessor. And lastly 3. Upgraded Android version up to Android 6.0 Marshmallow from Android 5.1 Lollipop. The phone sports an average display with a screen size of 5.5 inch which seems quite handy and has a resolution of 1280x720 pixels (HD) giving it a pixel density of 267PPI. Talking about the design, like the usual Samsung design standards, the Samsung Galaxy On7 Pro has plastic body making it look and feel cheap. The device is available in two colors Black and Gold. Samsung has unfortunately not upgraded to a better processor from the Galaxy On7, the Galaxy On7 Pro has the same Qualcomm Snapdragon 410 Quad Core processor clocked at 1.2GHz and combined with it is 2GB of RAM which should ensure decent multitasking. On the software end, the phone is based on the latest Android Marshmallow 6.0 out of the box with Samsung's TouchWiz UI running on top of it. In terms of storage capacity, the Galaxy On7 Pro gets 16GB of onboard storage which can be further expanded up to 128GB via a microSD card. For photography you have a 13MP rear camera with an LED Flash and on the front lies a 5MP shooter for those selfies and video calling needs. The rear camera can record videos up to 1080p. Powering all this is a 3000mAh removable battery which should last you through the day. The phone accepts Dual Micro SIMs and you also get NFC & 4G support and other connectivity features like the Bluetooth and WiFi. The Xiaomi Redmi Note 3, Moto G4 Plus or Huawei Honor 5C looks like fairly competitive devices in this price range. The Redmi Note 3 specifically has a better processor that boosts the performance of the device. Also in terms of camera, battery and other features the Xiaomi Redmi Note 3 looks like an overall winner here. 1. Does Samsung Galaxy On7 Pro work with Reliance Jio network? Ans: Yes, Samsung Galaxy On7 works with Reliance Jio network as its supports 4G VoLTE (Voice over Long-Term Evolution). 2. Is Samsung Galaxy On7 Pro compatible with USB OTG? Ans: Yes, Samsung Galaxy On7 Pro supports has a support for USB OTG (On-The-Go). 3. Are there any heating issues on Samsung Galaxy On7 Pro? Ans: No, there are no heating issues on Samsung Galaxy On7 Pro. However, the phone may get a bit warm upon continuous gaming. 4. Is Samsung Galaxy On7 Pro battery removable? Ans: Yes, Samsung Galaxy On7 Pro packs in a 3,000mAh battery which is removable. 5. Does Samsung Galaxy On7 Pro support 4K video recording? Ans: No, Samsung Galaxy On7 Pro doesn’t support 4K video recording. Although, it supports 1080p Full HD video recording at 30fps (Frames Per Second). 6. How is Samsung Galaxy On7 Pro camera for selfie? Ans: Selfie camera performance on Samsung Galaxy On7 Pro is above average. It’s decent in daylight conditions. 7. How much time does Samsung Galaxy On7 Pro take to charge?